So yup, since I’m on a furnishing roll and dreaming of all those new things I hope to have in my flat at some point in my life here’s another blog post about wishing, wanting and ‘wanderlust’ when it comes to my dream bedroom. With all my money worries this blogging stuff is acting as an excellent method of escapism really and actually let’s me focus on how pretty my place is going to be in the future! I do get a little bit overwhelmed by my bank account issues sometimes, but at the end of the day I am much happier being the only person responsible for my troubles that living with someone else and them being a factor on it all if that makes sense? I guess it’s because I’m more in control of my situation than others, although saying that it seems the council, car tax people and electrical companies are doing most of the control right now! So gone are the days of living with my parents with a single bed in the poxy little box room forever, and now we have the days of being an adult with responsibilities and a cat. My bedroom is one of those places that has quickly become more of a dumping ground now I don’t spend as much time in there, apart from my revamped dresser I’ve barely even hung anything on the walls. I do keep switching my room around to try and make it a bit better, but then I just get complacent and thing it’ll do as it is…. 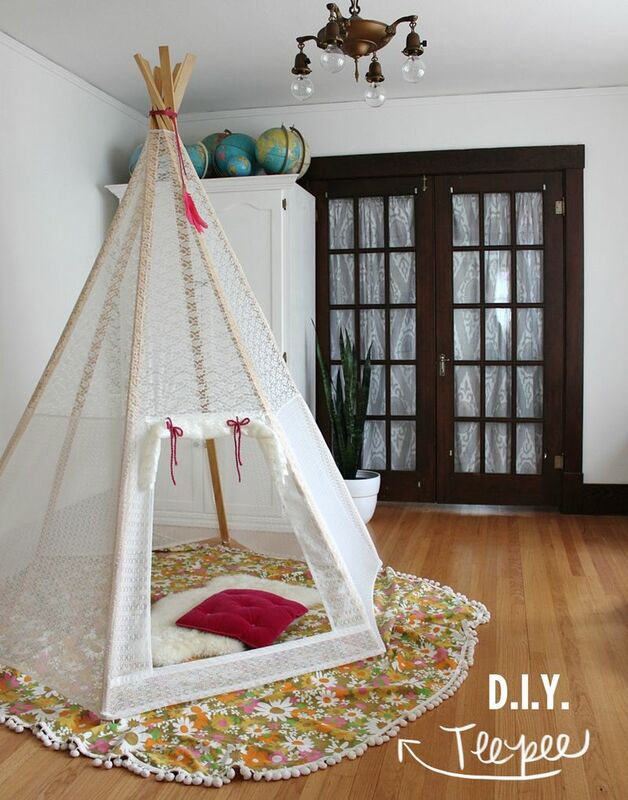 I’d love to at some point make this adorable teepee from A Beautiful Mess blog, I know I’m an adult and don’t *need* a ‘play’ teepee. But it’d just be a nice little space to sit in with Kitty and relax. Sometimes I think I get a bit down when I’m surrounded by crappy looking things, so even something that looked nice would be a bonus some days. Although how on earth I would fit this in my bedroom alongside my bed I don’t know… Unless it went over it or I combined it with the day bed I want from the previous ‘House a Home’ blog post I wrote. Boy, I have big dreams for this little flat don’t I? 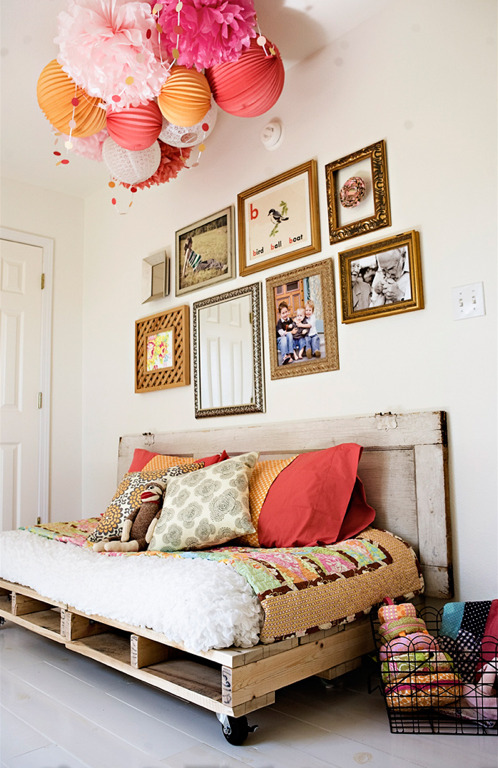 I have found this little picture of inspiration below though, which makes a day bed from a wooden palette. I don’t think my crafts skills are quite up to this level, but after seen Tereza’s DIY palette sofa I think I could actually make this possible?! All I need it some wooden palettes (anyone know where I can get these? ), a single mattress (picked up from somewhere like Furniture Choices), and some nice cushions and blankets…. Oh now I’m inspired and ready to go! (I say this now, but it’ll never happen, you know this). Sorry if you came to my blog after lipstick and beauty, I’m just not feeling the love for new cosmetics too much right now! Although don’t get me wrong, sometimes the power of blusher is one to make me at least look glowing even if I’m not inside…. What do you think about to take your mind off, well, LIFE?